Marrakech-based writer Mandy Sinclair gets soaked up in a tour of her favourite places across the land in the West. Morocco is different. It’s not like visiting a European city where there are monuments to see or a place like New Zealand where you find lots of adventurous activities to take part in. Nope – Morocco is about soaking up the atmosphere. Wandering. Exploring. Eating. – A night in the Sahara Desert. Yes it’s mega touristy and the camel trek to the camp is dreadful, but the scenery more than makes up for it. – A night or two in a palm grove, like the Draa Valley, Nkob or Agdz. I can assure you southern hospitality, amazing food, stunning scenery and lovely walks through the lush palm groves. If closer to Marrakech, I’d retreat here whenever I needed to get away for a couple of days. 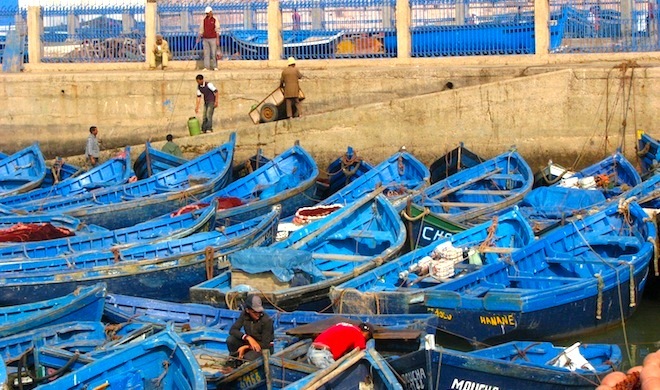 – Essaouira. My favourite city escape. For so many reasons. – Meknes, a city I’d call a mini-Marrakech. They have a great little medersa to visit, stunning architecture and a medina that is filled with locals. So unlike Marrakech, you can walk through the medina without being hassled. And a day trip to Moulay Idriss and Volibulis, which is so close and completely worthwhile. This is the wine-growing region of Morocco and apparently some wineries welcome visitors. – Assilah, a little gem I discovered during my summer vacation 2012. A cool, laid-back beach town with a chilled-out, arts-filled medina. I could have stayed here the entire vacation, lying on the beach, eating calamari, drinking beer. – Chefchaouen, a blue village perfect for wandering, listening to the sounds of weavers and get carried away in their little shops. A place I discovered on summer vacation 2011 and returned the following year. – A trip out to the Bridge of God in the Talessamtane National Park is a must. – The relatively unknown Oualidia is stunning. But it’s becoming a tourist haven. Go there now for amazing scenery, lagoons and birds. The guide books say flamingos love to flock here, I’ve never seen one. Nor has anyone else I’ve talked to. But it’s gorgeous. The capital city of Rabat is also beautiful, and a visit to the old ruins at Chellah is worth a visit. Take a guide and let your imagination run wild as the storks fly pass. But keep in mind that Morocco is a mountainous country. Travel here takes time. To see all of the above, plan at least two weeks. Having travelled both by organized tour, public transport and private driver, I’d highly recommend the latter. Personal service, personalize itinerary and no doubt you’ll leave with a new friend. So those are my tips. If you’d like to book a tour to Morocco, I’m more than happy to put you in touch with a tour operator colleague. A version of this blog post originally appeared on WhyMorocco.wordpress.com. EDITOR’S PICK Is Muslim Morocco becoming a land of wine?